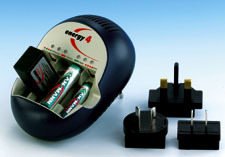 Ansmann Energy 4 Rapid Battery Charger . . . Specifications: The Energy 4 Rapid Charger will charge 4 AA or AAA, or two 9V cells. The Ansmann Energy 4 charger is designed for smaller applications but has the same great features as its big brothers, the Energy 8 & 16 chargers. The Energy 4 offers the most advanced charging control available today for some of the most commonly used sizes of Nickel Metal Hydride and Nickel Cadmium batteries used in electronic appliances. Great for wireless microphone applications! The charger accepts AAA, AA, and 9V. Just plug it in and it charges either AA, AAA, or 2 9Vs automatically and fast! The Energy 4 automatically reconditions batteries, before recharging. It will charge two 9V cells in a little under 2 hours. Each cell is charged independently, with simple progress indicator lights for each cell. Automatically switches to trickle charge as each cells reaches full charge. Detects faulty cells. Can also be used as a cell checker to determine reserve life of each cell. Three year warranty. Unsurpassed power! 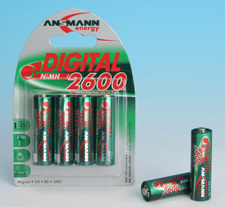 These 2600 mah AA NiMh batteries set the standard for rechargeable batteries. Made in Japan. High recycle and consistent performance. + Value based on quantities & prices of alkaline batteries with comparable average battery life from leading manufacturers. Reliable product at an affordable price!